But Ilsa stopped me in my tracks. “No.” she said. I was pretty sure I had misunderstood, so I asked her again. Instead of asking her “who are you and what have you done with my six-year-old” I watched her eat an entire bowl of oatmeal with milk. Plain. And then, as if the forces of the universe hadn’t toyed with my sense of the proper order of things quite enough, my eleven year old came in and proceeded to do the very same thing. This brings me back to the thought that I had a few months ago when we began our Year of No Sugar, namely, that contrary to our assumptions, perhaps children may have an easier time with the omission of sugar in their foods, since they haven’t had as many years to get addicted as us tall people. However, if that isn’t sufficient evidence, I hereby present exhibit B: the popsicle experiment. Both kids have been mentioning that not having ice cream this summer is going to be one of the hardest parts of the project. Therefore, when I saw some plastic make-your-own-popsicle molds I jumped at the chance to replicate an ice-cream-ish-experience in our own no-sugar universe. Our oldest, Greta, was especially excited and asked to make them… repeatedly. Folks, this child has the determination of a jack hammer. After a few days of not making popsicles I, in desperation, ran out and bought the ingredient we had been lacking: yogurt. 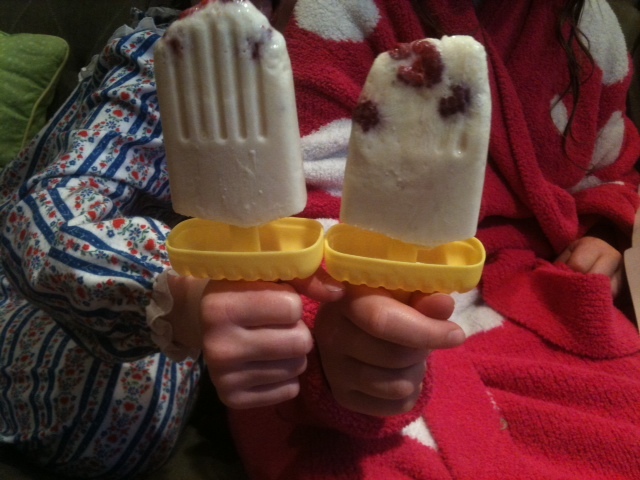 We raced home and mixed up a batch of banana yogurt popsicles that were- hooray!- frozen by dinner. You know where I’m going with this: they love them. The kit makes six popsicles, so we were set for a satisfying “dessert” for the next three nights. Next time around I tried to be a bit more creative, adding in fresh strawberries so they turned pink in the blender, (turning anything pink is always a good move in a house with two girls) and then adding some frozen berries to float randomly about like little prizes. Again- super big hit. Huge. But here’s the kicker: the other night I tried one and- don’t tell the kids, but- I’m not as impressed as they are. They’re good, but… very icy. Like sucking on a milk icicle. And not… forgive me… sweet enough. Gasp! So there you have it. I have officially become fussier than my kids. Which is a relief, because at least for the moment I can relax that I’m not ruining their lives… in this way. Of course, I plan to continue my groundbreaking popsicle research in the interest of making zingier cold treats, but basically that’s for my benefit. The kids are perfectly happy. Go figure. Here’s a link to an interesting recipe (it’s not mine) that I hope to try this summer. It does have honey so you’d have to modify that but I like the overall approach to a whole food ice cream. 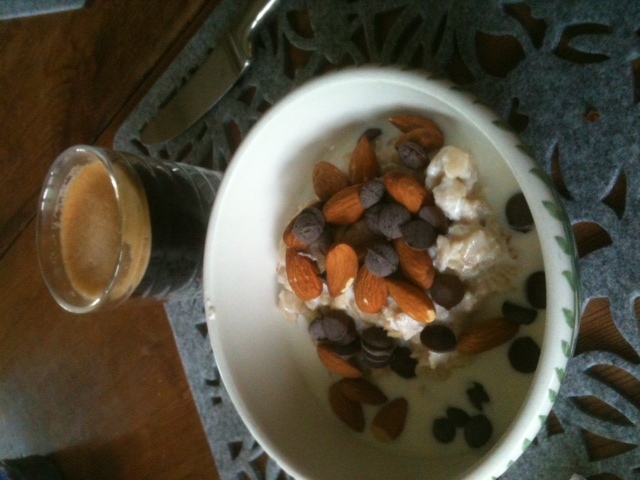 You are currently reading A Year Of No Sugar: Post 49 at Eve O. Schaub.